A month has slipped by since my last blog post. I’ve been busy in rl, with interviews (fruitless – finding the hole in someone’s project is a good way to avoid trouble later but not a good way to get offered the job), helping my daughter move flats (200 miles from where I live), and one job finishing as another starts. And also video making takes time. So here’s another machinima. Filmed at The Wastelands, which is a post-apocolyptic role-play area in Second Life. I was concerned that I’d breezed in and done my own thing – there’s no crime against it, but I don’t like to disrespect. But I had one response from a resident who after seeing it said; ‘I think that your video is perfectly in line with the mood and feel of our creations. Melancholy yet hopeful. Human connection’. That really made me feel that I needn’t have worried about appearances, as I’d got the emotional content just right. And that is what moving image work should achieve above all else. 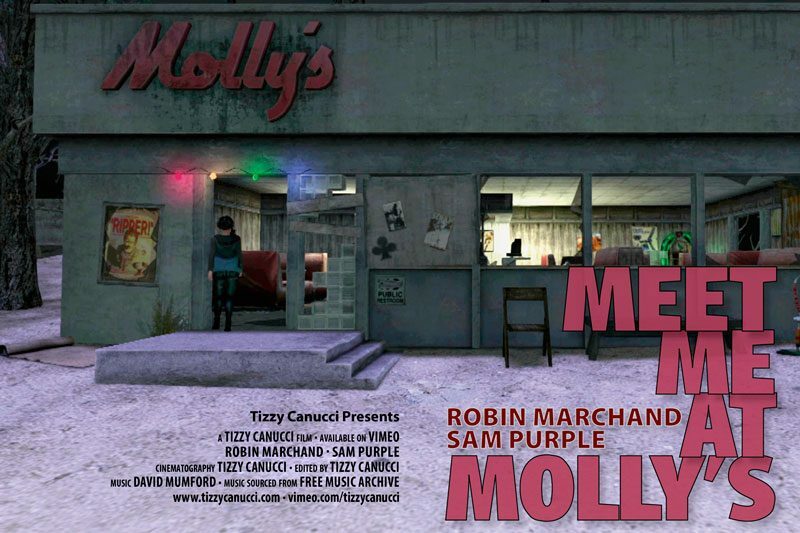 Meet me at Molly’s from Tizzy Canucci on Vimeo. It might seem that it was planned to fit the music, but it was the other way round. I had decided on using another piece. I swapped them over about half way through putting it together as the tone fitted it better. The thing I lost was that I intended the relationship between Sam and Rob to be ambiguous (are they lovers or maybe brother or sister, and which is Sam or Rob?) but the lyrics place them as escaping lovers – two people for whom crossing The Wastelands (in reality or metaphorically) was a better option than staying where they were. The one thing that I really wanted to do was kept in though – it is a narrative without words, a story told entirely through visuals. That was a challenge I wanted to do for itself. But I am also not entirely convinced by avatars mouthing words – though I’m sure do another day! ‘Perhaps I should do something a bit brighter next time’ was a comment from a friend. It’s true. So much of my video work is melancholic, though not, I feel, pessimistic. Maybe it’s being a northern European, or maybe it does reveal a sense of loss loneliness and insecurity below a protective skin of creativity, wit and apparent self-assurance. I did at this point suggest the next one should bring on the dancing girls – he seemed quite keen on that idea. If the Coen Brothers can do a tribute to Busby Berkeley in Hail, Caesar!, why not? In the end, you don’t do tributes because you think you can do better, simply because you admire what they did. Finally, while I’m writing, I have done a much shorter video, Street Spirit, which is a record of an installation I did for the Radiohead weekend at Furillen about a month ago.